Everyone knows how the in-hand classes are becoming extinct so why not spruce them up some? Plus many of us are older or young and do not care to run through the dirt with abandon while showing how out of shape we are. Lets combine Liberty classes and In-hand classes. The class would run with one horse in at a time and the judge would look over the horse while the horse is stood out then the handler would turn the horse loose for an appropriated time then catch the horse and the judge could stand the horse out again or send the horse out of the arena and call upon the next horse. Once all the horses are through then they would all come into the arena and the judge could look them over again and place the class. Yeah maybe it is a little over the top or time consuming but, it would be pretty! Plus it is much different than other breeds and exciting. Something like this is bound to acquire attention on many levels especially from people just getting into Morgans or horses at all. It is also a class Amatuers and kids can compete in easily without having to worry about too much. 12 Responses to InGenious In-Hand! I like the idea. What would make it even more exciting would be if music could be incorporated into the liberty part of the judging. IMO, too time consuming… and think of the pulled shoes. Yikes. You probably would not have a lot of participants. I don’t know about the whole idea. IED is right about the pulled shoes. I think less people would do that then the regular in hand classes just because of the danger of the horses falling down and hurting themseleves. They would probably get too anxious. For fun it’s a good idea but for shows I think it would be a disaster. Why would it be a disaster? Lots of other breeds do it. The arabs started doing it in the 1980′s. I was there for the first year they held the class at the Erie County Fair. 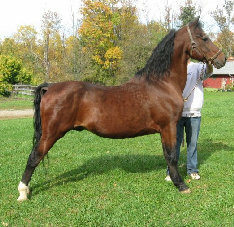 My friend had a beautiful stallion which she entered. The class was held in a back ring with one side of tall chain link fence. The stallion was turned loose and was just floating along…until he ran into the chain link. His legs loosened the bottom of the fence and he began to slide under it. The ragged fence bottom tore open a huge gash in his chest. He recovered, but bore numerous scars from the class. Yes, not all rings are chain link, but many have other hazards (low walls to try to jump, supporting poles in corners to knock a leg into, etc…) Being turned loose in an unfamilar environment with the added excitement of a show atmosphere and cheering crowd is a recipe for disaster IMO. It may be fun to watch, but I’d never enter one in it. I agree with colwilrin. My horse would never be able to enter that type of class. He gets excited in his paddock never mind having him turned lose in an unfamiliar enviornment with distractions. If they had a class like that I bet a lot of horses would get injured. Upon first reading this, I thought “what a cool idea.” Now having read some of the concerns, I have to say that though it would be fun – it’s probably not worth it. I agree that the risk of injury and exciting/freaking the horses out would NOT be a good thing. Although I do agree that the welfare of our horses takes precedence over all else, I also must add that I have seen many, many liberty classes from a wide range of breeds and I have never seen any accidents or injuries. I’m not taking either side but that is something that should be put into consideration. Any time you get a group of animals together in a possibly exciting situation, there are bound to be mishaps- be it a liberty class, park class, western class, etc. You must admit that there is an element of risk in every class. Mass Morgan used to offer these classes in the late 80′s early 90′s. I am guessing they were removed due to lack of entries. They were always fun to watch. I liked this idea for a few reasons one of which was being able to see a horses “real” movement I guess you could say. Besides their conformation I have myself really begun to see how much the gait is not only affected by the conformation by how it also affects the conformation. Spending time with gaited breeds and many others has really made me realize much more. I find sad through that some here believe that their horses could not compete in such a class and while I understand that these are our babies I also believe that if my horse cannot move well by itself alone in an arena then how will it care for me when I am riding it? I do understand also that none here know me in person but, I pray that from here on you would keep it as an understood FACT that I, personally, would never turn a horse loose or allow such a class as is being discussed without being completely SURE that the arena to which said horses are being turned into it secure. You have my word. I have seen what can and does happen myself but, again, as I also come for a business world I do understand that something has to change in the way that we show our horses so that it is more interesting to newcomers and others alike. We are trying to accrue customers not bore them to death.